A home does not always have adequate ventilation and at times the options available are expensive and unsustainable. Window fans are a great option for individuals with ventilation problems. The products are affordable, powerful and energy efficient. In addition, they are quick and simple to install and customize. The best household window fans have varied functions. The functions include drawing fresh air from outside into the room, expelling stale air and facilitating air circulation. Furthermore, they have amazing features such as remote control, digital thermostat and LED display that make monitoring of the settings simple and convinient. Also, there are different sizes and number of blades to choose from depending on the room size and air circulation requirements. However, it is no easy task to choose the best window fan. The review will guide you so that you are a step closer to getting the right product for your home. 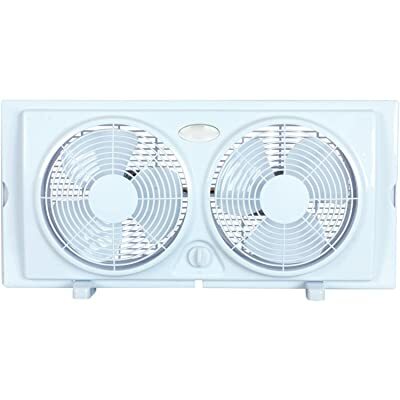 The twin reversible fan is a product from Bionaire with 8.5inch blades. The blades of the fan are independently controlled. It has three settings of speed to allow the user to choose the most appropriate depending on the need. The speeds include medium, high and low. The LCD screen allows one to see the temperature selected and the current room temperature making monitoring effective. Also available is a programmable thermostat that allows operating the fan either automatically or manually. The thermostat also enables the quick turning off and on of the system if there is need to maintain the temperatures in the room. The temperature ranges that the thermostat operates are between 60 to 80 degrees. It also has a reversible airflow control feature that facilitates the change in direction of the blades. This change allows the blades to take in fresh air and exhaust hot air from the room. The installation of the window fan is quick and simple. There is a built-in adjustable extender allowing the screen to expand and fit large windows. In addition, available are slider safe extender panels which provide stability if the orientation is vertical. Another fantastic feature is the remote control that uses 2 AAA batteries. The remote has several buttons to change the speed, type of operation, direction of airflow and temperature. It makes it convenient since you can use it up to 15 feet away. Most noteworthy, the motors of the fan are water resistant and UL approved thus safe for use during rain. Finally, it comes with a limited warranty of 5 years. 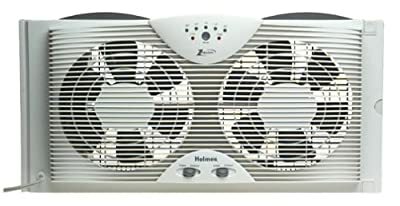 The product from Holmes has two blades that operate to cool the room. The dual combination significantly increases the rate of cooling. Apart from the dual blades, the product has two settings of speed. The settings allow the user to choose the best speed to optimally cool the room without affecting comfort. It also has a manual- reverse flow control of air to switch the fan from intake to exhaust. The dual blade window fan has an excellent design that enables it to fit most double hand windows. Moreover, it also fits comfortably in the slider windows in homes. There is an adjustable extender screen and panel that assists in securing the fan in very large windows. They give stability especially with vertical orientation of the fan. Most noteworthy, this white window fan is suitable for large rooms. Also, it helps to save costs since it is energy efficient using less energy by up to 60%. Another great feature is the motors that are water resistant. This makes the product safe to utilize when it is rainy. The fan is also efficient in operation and quiet thus suitable in any room of the house. After purchasing the twin fan, a limited warranty of one year is available. 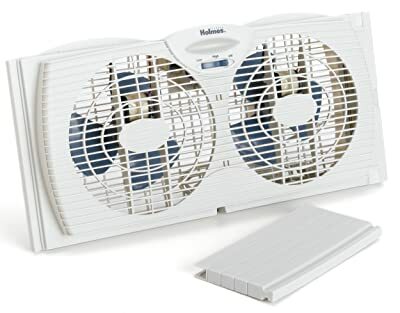 The dual blade window fan measures 25.9 by 13.5 by 5.7 inches. It has dual blades that measure 8.5 inches in diameter. It is a cost effective product that comes with two digital settings to ensure comfort. There is also a one-touch thermostat enabling the control of fan speed and air temperature for adequate air flow. The product allows for either manual or automatic operation. The fan is a great choice for many homes since it fits almost all window types. The adjustable screen on the product ensures expanding to fit double hand and slider type of windows. Like many of the fans, the product has water resistant motors to allow it function no matter the weather. Most importantly, the reverse airflow feature allows the fan to electronically reverse each of the fan blades to intake or exhaust air independently. Apart from being affordable, the Holmes dual blade window fan is energy efficient since it uses 60% less energy. The product from AirKing measures 26.8 by 11.2 by 26.2 inches. It fits opening of windows that are between 27 to 38 inches wide and 26.25 high. The fan has the ability to circulate air in residential or office settings. Selection of the desired speed is possible using the front-mounted rotary control. Most noteworthy, the design of the product allows you to close the window without dismantling it. This is in cases where the weather is unfavorable. The materials making the fan are powder coated steel and resistant plastic ensuring its durability. The resistant plastic makes the housing of the fan protecting it from any impact. The motors are powerful facilitating instant air circulation and cooling. Furthermore, its quality is guaranteed since it has ETL and OSHA compliance. It has three main speeds to choose from. Defects in the materials or workmanship of the product are taken care of with the year limited warranty. The thin window fan is a manual product that disperses invigorating coolness in a room enhancing the freshness. The manual sections of the fan include the controls and thermostat. It measures 27 by 6.6 by 9.2 inches and has three-speed settings. The best feature of this fan is the power it possesses. It has a 40% greater velocity of air compared to any other fan. In addition, it has a reversible airflow feature that allows reversing of the fan. This allows the taking in of fresh air, exhaust of stale and full air exchange for total circulation in the room. Most noteworthy, the screen area of the fan expands to enable it to fit in larger windows. Also useful is the slider safe panels for extending support during vertical orientation. 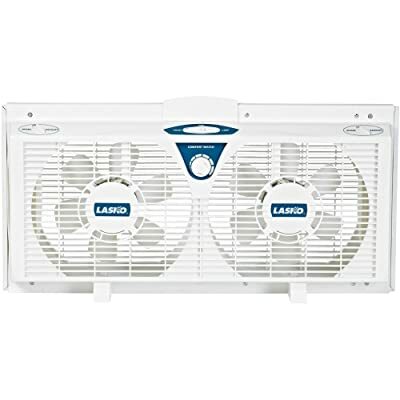 Firstly, the fan is a product of Lasko. The material making it is plastic and it measures 25 by 5.2 by 12 inches. It has two blades that facilitate the flow of air. Furthermore, the blades operate at a great speed without any noise being produced. The fan fits windows that measure about 25 to 35 inches and 12 inches in height. An E-Z click expander is part of the product and it helps in safely installing the fan. Also, it ensures a custom fitting. Another excellent feature is that the fan can be placed on the floor without necessarily fixing on the window. This is possible by using a snap on feet that is available. 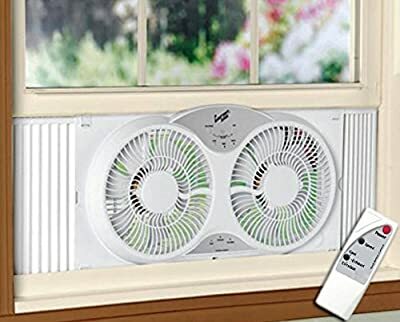 The Holmes Twin window fan is a product that has six blades and it comes fully assembled. It has a fan diameter of 228.6 mm. The material making the fan is lightweight plastic. The dual operation has independent electronic motors that are reversible. Furthermore, there are three speed settings to choose from which include low, high and medium. For the thermostat, it has a manual control set that maintains the comfort level. The use of the fan during the rainy season is possible since the motors are water resistant. The product is a sure fit as it has adjustable extender screens that secure it in large windows. Also, specifications on the size of the window that the fan fit are available. It is suitable for minimum opening of windows of 25 inches wide and height is 12 inches. The three year limited warranty protects the buyer in case of any damage. The fan from Optimus is a beautiful one that is pocket-friendly. It is suitable to fulfill your needs as the consumer since it can comfortably pull in cold air and exhaust stale air out. There are two speeds available to use. Furthermore, apart from having the motor water resistant, the motor design speed ensures that the product keeps running to create a conducive environment. Another great feature is the manual reversibility to allow either drawing in or out of air. In addition, you are able to control the speed no matter the function the fan is conducting. The only downside of this fan is the noise that it produces when in operation. The fan is a product of HowPlumb and measures 25.2 by 4.8 by 13.8 inches. It functions to cool the room, exhaust air and enhance air circulation. It fits windows that measure 23.5 to 37inches wide and 12 inches by height. Most noteworthy, it is a remote operated fan creating convenience of changing the speed at a distance. Also, it comes with two removable covers. The covers attach to the front of the fan when it is not operating to keep out hot and humid air. Furthermore, a bug screen attaches at the back of the fan to keep pests out that might interfere with the operation of the fan. Another addition to the product is two snap on feet that facilitate the use of fan on the floor or table. Finally, the fan reverses without having to turn it around and it is ETL listed showing compliance. The window fan measures 26.5 by 8.2 by 22 inches and has three paddle blades measuring 16 inches. The fan fits windows with a double hung style. The best fit is for windows measuring 26.5 to 35.5 inches and 22 inches high. It has three speeds and operates quietly no matter the speed set. The motor design allows it to be electrically reversible using the turn of dial. 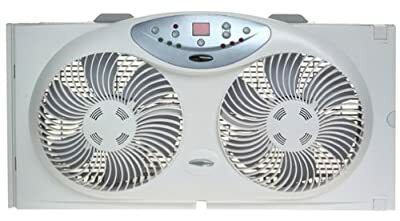 This creates convenience since there is no need to physically turn the fan. 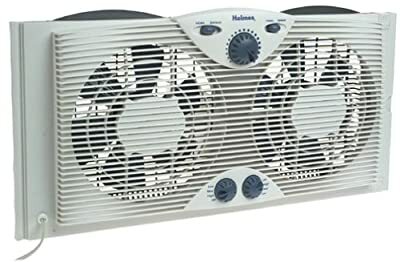 It is a powerful fan able to bring in cold air and expel stale air creating a cool environment. In addition, a storm guard feature is in place to protect the product during unfavorable weather. The product also includes a fused safety plug that is patented. Finally, it is ETL listed enhancing trust. The final product to review if from Bionaire. It is a thin type of fan with a beautiful black and blue color. The fans’ design allows it to fit in windows measuring 25.5 inches wide minimum by 8 inches high. However, extension of the width is possible using extender panels. The fan has three independent speed settings. Most noteworthy, the control panel is digital since it is LED. Moreover, the thermostat is electronic making it simple to operate and the airflow is manually reversible. The installation of the fan may be vertical or horizontal depending on preference. The fan has a greater air velocity of about 40% and reduces window obstruction by being 25% more compact. Finally, it comes with a limited warranty of five years. The protection of the fan is crucial to ensure its durability. Some of the safety features to look out for include a casing to protect the entire fan from impact. Also, a screen for keeping away insect pests and a storm guard in case of unfavorable weather. Motors that are water resistant are also better since they ensure the fan is working despite the rain. The fan should be able to work efficiently and with power to quickly draw air in and out. 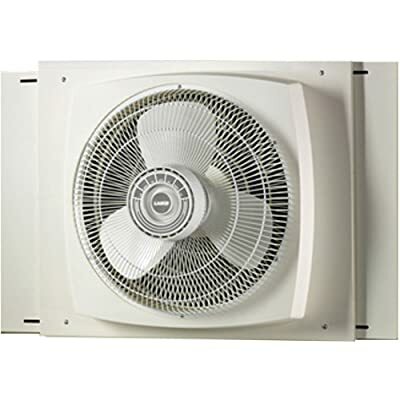 A powerful fan is best suited for use since it works to also facilitate air circulation. Some fans have a higher percentage to allow greater velocity of air. Since the prices of the fan vary, choose the one that meets the basic functionalities and lies within your budget. 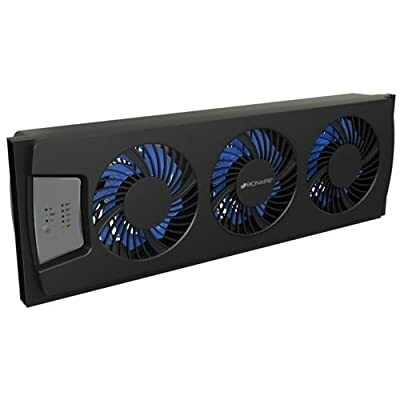 The cost of a fan does not guarantee its functionality. Invest in a product that is durable to avoid having a recurring cost. Also, consider the shipping and installation charges. 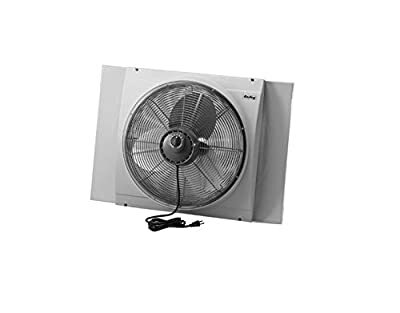 The fan size is important and depends on the size of the room that you want to install the fan. The blade sizes vary from 9 inches to 16 inches. Also check the overall dimensions of the product and see whether the dimensions stated align with your window. Many manufacturers give an estimate of the size that the fan fits in. Finally, factor in the use of extenders that allow custom fitting. There are basic features you should look out for in a fan. They include the speed settings, blade type and number, remote control, thermostat type, extenders and noise level. We all love to have fresh and comfortable environment. It might get difficult to find the right product to use. . Deciding on the best window fan is no simple task and taking adequate time for research is key. Furthermore, ensure to identify the key features that will help you meet your needs. Create a checklist to help you eliminate products that do not match your wants. The discussed window fans are a great start to choose from. Their features and prices are among the best since there are numerous products in the market. Don’t forget to consider the size, price, features, power and safety.